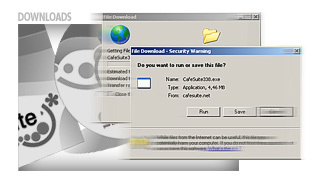 You are welcome to download and use the latest free version of CafeSuite for as long as you need. The installation package includes both server and client applications. The free version is fully functional, all modules are enabled and it will work with any number of workstations, accounts or products. The only restrictions of the free CafeSuite version are that operators can login to CafeStation without entering the correct password and CafeAgent opens the following portal website when session starts on client PC. If you decide to purchase software license, please place your order here. Once your order is processed we will send you the license key that would register the software and remove limitations of the free version — there will be no need to reinstall anything! You shouldn't downgrade CafeSuite by installing older version over a newer one as it might not be backward compatible. If you want to go back to a previous version, you should restore backup files that were created when you were using that release.